Minestrone soup handmade in Calabria and imported by Lucini Italia. CAPSULE REPORT: Handmade in sunny Calabria, a region of southern Italy that stretches between the Mediterranean and Adriatic Seas, Lucini Italia is a newcomer hoping to make a difference in gourmet tomato sauces and soups. 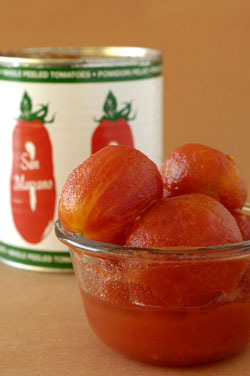 A big difference is the San Marzano tomatoes: so sweet, you’d swear the products contain tablespoons of sugar. But they don’t have a drop: It’s the delicious tomatoes. If you don’t know what to try first, start with the especially noteworthy Artisan Cheese Sauces: When was the last time you had a great tomato-cheese sauce? We love the Robust Tomato Gorgonzola sauce. Lucini Italia has come to America to add color to our dishes with tasty tomato-based sauces and soups, handmade by Calabrian women with a long tradition of good Italian cooking. It shows: there’s nothing that a martinet Italian grandmother wouldn’t put on her own table. The products are made in small batches from the highest quality ingredients: pure San Marzano tomatoes, fresh herbs, vegetables, cheese and fine extra virgin olive oil (also made by the company). There’s no added water, sugar, tomato concentrate, dried herbs or anything that isn’t primo. In a line of tomato-based products, it is the wonderful San Marzano plum tomatoes, harvested at their peak flavor, that shine through. The fruit is so sweet (tomatoes are fruit) that you’d swear the sauces and soups have sugar added—as so many other products do, much to our chagrin*. They don’t: It’s the natural sweetness of the tomatoes. *Look at the label of many tomato sauces and you’ll find a lot of sugar. Ostensibly,manufacturers are trying to emulate what nature provides in the San Marzano tomato. To us, it tastes terribly artificial, like the sugar bowl dumped into tomato sauce. And, unlike naturally sweet tomatoes, it has bad sugar or HFCS calories. 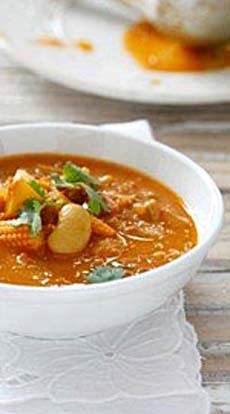 The company currently offers a total of nine sauces and two soups. Four of the sauces add different cheeses to a tomato base, while five are tomato-only. Traditional pasta cuts and wine pairings for each, mentioned below, are provided by the producer. For more information about cuts of pasta, or to see photos of the cuts discussed below, see our Pasta Glossary. Cheese-lovers will be excited by this line. There’s a lot of tomato sauces out there, but few tomato-cheese sauces. Lucini has done a lovely job blending the two ingredients. The amount of cheese is in perfect balance; the tomato and its acidity are the perfect partner to ensure that the sauce is not overly rich. It’s the best of both worlds. Creamy Tomato Ricotta Sauce is a Central Italian recipe, adding ricotta as well as a touch of Parmigiano and Pecorino Romano cheeses. Try it with rigatoni and a garnish of chopped Italian parsley. Rigatoni, the most commonly used cut in southern and central Italy, are large, ridged, slightly curved tubes of pasta with square-cut ends. For an authentic experience, pair with a Vermentino wine. Robust Tomato Gorgonzola Sauce is a north-meets-south recipe: Creamy blue Gorgonzola cheese from the north of Italy meets the plum tomatoes of the south. Toss with fettuccine (also spelled fettuccini), which are cut from flat sheets of pasta cut into ribbon-shape strands (fettucce—the name means “small ribbons”). Fettuccine is one of the most popular pasta shapes, wider than the other popular flat shape, linguine. Enjoy this dish with a Nebbiolo wine. Rustic Tomato Vodka Sauce is a Northern Italian recipe made with Pecorino Romano and Parmigiano Cheeses and a touch of vodka. It is traditionally served with farfalle (bowtie pasta). Farfalle are versatile for most purposes and sauces, but showcase well with lighter and creamy sauces, like cheese sauces. Serve a Nebbiolo-based wine with this dish, too. Savory Tomato Parmigiano Sauce, in a recipe from Central Italy, is traditionally served with penne rigate. Penne is the Italian word for “quills” or feather pens: Penne pasta are large (2"), straight tubes cut on the diagonal to resemble the point of a quill. They are one of the most famous and popular pasta shapes, a specialty of the Campania region of southern Italy. Rigate cuts are ridged to hold sauce better. Enjoy the dish with a glass of Dolcetto wine. 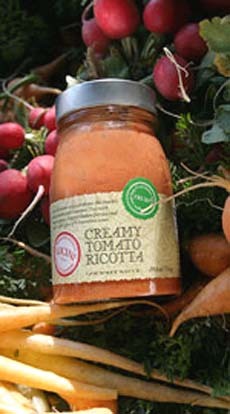 After the Artisan Cheese Sauces, the Tomato Sauces are less showy, but they bring the same quality approach. Hearty Artichoke Tomato Sauce, a sauce from Puglia on the southeastern coast, is traditionally served with farfalle (bowties) or conchiglie rigate (ribbed shells), which serve as a “scoop” for the sauce. Fill your glasses with a young Sangiovese wine. Rustic Tomato Basil Sauce, a simple Tuscan sauce, is traditionally served with capellini (long, thin strands of round pasta only slightly thicker than angel hair) and enjoyed with a light-bodied red wine. Try a young Pinot Nero (Italian Pinot Noir). Sicilian Eggplant and Olive Sauce, a sauce version of caponata, is traditionally served with rigatoni or with gemelli. Gemelli, the word for “twins,” are two short strands of round pasta that are twisted together to make an attractive cut that holds the sauce well while retaining an al dente texture. Enjoy this dish with a full-bodied red wine such as Sicilian Nero d’Avola. Sicilian Olive and Wild Caper Sauce, a Puttanesca recipe that has both green and black olives, is traditionally served with pennette rigate, a smaller-size penne rigate, or with rigatoni. Serve it with a full-bodied Merlot. Spicy Tuscan Tomato Sauce, a fiery Arrabbiata style, includes fresh, red-hot chiles (arrabbiata means “angry” in Italian, referring to those hot chiles). It is traditionally served with pennette rigate or conchiglie rigate (ribbed shells) and Chianti, which has the tannins to stand up to the chiles. Tuscan Marinara with Roasted Garlic Tomato Sauce, a recipe from Central Italy, is traditionally served with spaghetti, the most famous and oldest-known cut of pasta. Spaghetti is the diminutive of “spago,” meaning cord or string. It works best with oil- or tomato- based sauces, which are thin and allow the sauce to cling to the pasta. Enjoy this dish with an earthy Primitivo wine. The two soups are worthy of your attention. They have the same sweet tomato profile, each with a special character of its own. Roman Tomato Cream Soup has a beautiful salmon color. It can be enjoyed as is, but with the right counterpoints makes a beautiful dish. We suggest a dab of plain yogurt and a garnish of fresh-snipped basil or chives. Rustic Italian Minestrone Soup has lots of vegetables and herbs (you can see the fresh leaves of parsley) on a base of the company’s extra virgin olive oil. The company suggests that it be topped with shaved Parmigiano Reggiano cheese before serving, but it’s so flavorful, it needs nothing more—not even a grind of pepper. If anything, we’d add some chopped fresh parsley for garnish, and save the Parmigiano Reggiano for dessert. San Marzano tomatoes. Photo by Dhanraj Emanuel. San Marzano tomatoes give Lucini products their wonderful natural sweetness. Grown in the town of San Marzano at the base of Mount Vesuvius, southeast of Naples, the volcanic soil and sunny climate create plum tomatoes that are among the most sought-after on earth. They have an elongated shape, believed to be a mutation, with only two seed pockets (most tomatoes have five to seven†). The pulp is dense, and because the variety has lower acidity, the tomatoes have a natural sweetness; sauces made with them require no additional sugar. The varietal is not exclusive to San Marzano, Italy: It is grown in the U.S. and elsewhere. But the local soil has a great impact: We haven’t found any domestic tomatoes that taste this sweet! Read our full review of San Marzzano tomatoes. †It’s the seeds that carry the acidity of the tomatoes; hence the lower acidity/greater sweetness of San Marzanos. The company also offers oil and vinegar...but such riches are food for thought for another day. 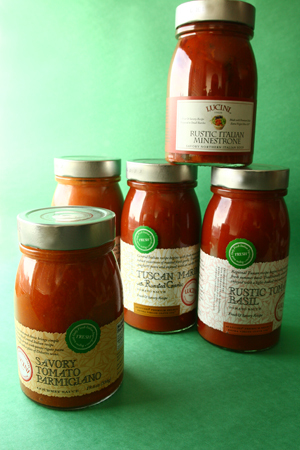 Lucini Italia sauces and soups. Why try to look for the perfect Italian sauce recipe when you can spoon sauce like this out of the jar? Prices and product availability are verified at publication but are subject to change.